In his weekly, President Obama is addressing the crisis at the pump…that is rising gas prices. Is it directly connected to what’s going on in Libya and the oil producing states over there? No one’s really saying. Have the oil giants implemented some crisis management on the consumer? On Thursday, my Attorney General also launched a task force with just one job: rooting out cases of fraud or manipulation in the oil markets that might affect gas prices, including any illegal activity by traders and speculators. We’re going to make sure that no one is taking advantage of the American people for their own short-term gain. And another step we need to take is to finally end the $4 billion in taxpayer subsidies we give to the oil and gas companies each year. That’s $4 billion of your money going to these companies when they’re making record profits and you’re paying near record prices at the pump. It has to stop. This week’s message goes back to a campaign issue that’s been on the table for the Obama administration since taking office — clean renewable energy. Eventually the oil well will run dry, but that doesn’t seem to worry deficit hatchet swingers in the Congress who aren’t convinced investment in clean renewable energy technology is worth the time and money as off shore drilling (and years of clean up – i.e. BP oil spill and others that haven’t made the front pages). Aren’t we tired of generations of lip service to “looking out for the future,” and “helping the children and grandchildren”? By now someone should’ve figured out, your 15 minutes are up when you reach 21. And if you don’t vote? You fall into another lost generation and it’s time to start again on the next generation. If anyone’s invested in the future, it’s the people who desire to live and thrive in it. Clean air would be a big help. For some reason the press and Jones’ own admirers in the blogosphere decided to stick to one remark in this 20 minute speech “DC is stuck on stupid.” Perhaps DC isn’t the only one who’s stuck. Being an engaged citizen can be just as time consuming and demanding as being a politician. you’d put on peer pressure to achieve higher. aren’t you a bigger hero for helping your other friend get an A on his presidency? I love the Washington Post‘s Peeps Show contest. This year the winner of the best peeps diorama went to Mary Jo Ondrejka of Reston, Virginia for her depiction of the rescue of the 33 miners in Copiapo, Chile. For those of you who don’t get the Peeps, this is an annual contest presented by the Washington Post around the Easter holiday because it’s the only time you can get these little marshmellow chicks and rabbits in the grocery store practically at bulk rates. Saw E-Notes in front of Metro Center this afternoon. 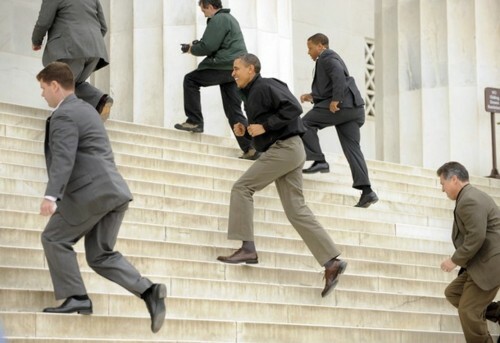 He was telling me about this photograph of President Barack Obama climbing the stairs of the Lincoln Memorial yesterday. Looks to me his Secret Service detail will be more out of breath than the President when they reach the top of the stairs. But I digress. Read E-Notes’ take here. By now we get it that Republicans want to privatize and weaken government in critical social areas using skirmishes like “abortion” to rally their more passionate base. Somehow, the face of the new Republican generation, Rep. Paul Ryan of WI dropped off the front page this weekend with his 2012 budget proposal that chops away at medicare and medicaid while awarding more tax breaks to the top 1%. He’ll be back. Democrats want to strengthen government in critical social areas but can’t seem to find the right words that stick with the American people or rally their base. Who’s the face of the new generation for that party cause? Boston Globe cuts in the Transit Administration capital investment grants may affect bus and rail transit systems throughout New England. Also affected could be funding to clean drains and sewage systems to comply with the Clean Water Act. The White House sent David Plouffe their Senior Advisor on the talk-show circuit to frame the next round. Will his words stick? We shall see. Though this quote doesn’t quite make one leap to their feet – “Compromise is not a dirty word.” What IS compromise vs. what it isn’t in governing? The bedrock of getting the job done in a democratic society (?) Just a draft thought. The President’s Weekly was about “good news.” “The biggest annual spending cut in history.” We avoided a government shutdown. People will get paid, parks will be open for the weekend, and some important projects like infrastructure will have to be shelved for the moment. Hopefully, a bridge maintenance project won’t send a message back with a structural collapse. Actions speak louder than words. In the meantime, I’m looking for that score sheet on the budget. The one that keeps up with the American people. And perhaps President Obama will ask Lincoln where he can find three generals – Grant, Sherman, and Sheridan – for the next budget battle. Update: The Washington Post has a nice line-item budget cut score sheet as part of this article. I guess the narrative does have to turn to what this was all about from the start. Them That’s Got Shall Get…. So this whole budget battle is just about funding for Planned Parenthood? I don’t think so. There are a lot more devilish details in these billion $$$ budget cuts. Senator Bernie Sanders (VT) exposes some here. Filmfest DC, the Washington, DC International Film Festival, marks its Silver Anniversary this year. Slated for April 7 – 17, 2011, the Festival will celebrate 25 years of presenting the best in new international cinema in the nation’s capital. Ticket information and the complete festival catalog are available on www.filmfestdc.org. “Justice Matters” features documentaries and films that thematically bring into focus human and civil rights issues calling for humanitarian intervention and a more informed and engaged social advocacy. Download a “Justice Matters” series media release from this link. for her alleged role in the killing of the boyfriend who had abused her and forced her into prostitution. More. In early 2009, a new generation of Iranians hoped for change through the upcoming presidential elections. Fueled by youthful exuberance and media technology, a groundswell—the so-called Green Wave—emerged to challenge the status quo and caused a seismic shift in the political climate. More. From the award-winning team that produced Death of a President and The Last King of Scotland, I Am Slave is a controversial thriller about the slave trade in present-day London and one woman’s fight for freedom. More. Chile’s isolated Atacama Desert offers an excellent vantage point on the past. The dark sky attracts astronomers, who have built some of the world’s most sophisticated observatories in a quest for information about the universe’s origins. But the region also holds memories that are more recent and more raw: This is where Pinochet’s regime built its largest concentration camp and buried many victims of summary executions. More.